New UNI President Mark Nook. The Board of Regents Tuesday selected the chancellor at Montana State University Billings, Mark Nook, as the new president of the University of Northern Iowa in Cedar Falls. The board interviewed all three finalists one more time before opening their closed session and voting to hire Nook. Regent’s president Bruce Rastetter made the announcement. 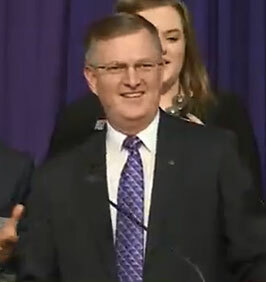 “It is with my indeed pleasure that I get to introduce to you the 11th president of UNI — Doctor Mark Nook. Please join me in welcoming him,” Rastetter says. Nook was named the chancellor at Montana State in 2014 and has a background in astronomy, including a masters degree in astrophysics from Iowa State University. “First of all, I can’t tell you how honored and humbled I am,” Nook says. “To think about being the 11th president of this fantastic university is a great honor and humbling at the same time.” Nook was joined by his wife Cheryl for the announcement. “To everyone on this campus who has made Cheryl and I feel so welcome, last week and the first part of this week, we can’t say enough. You convinced us this really was the place to be,” Nook says. Nook will take over as the new president on February 1st, replacing Bill Ruud who left to become the president of Marietta College on July 3rd after three years in Cedar Falls. The Board of Regents approved a three-year contract for Nook with an annual salary of $357,110. Jim Wohlpart, the UNI provost and executive vice president for Academic Affairs, was also a finalist as was former Temple University president Neil Theobald.